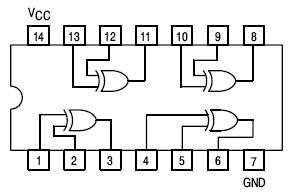 The full adder circuit performs binary addition on three one-bit numbers. 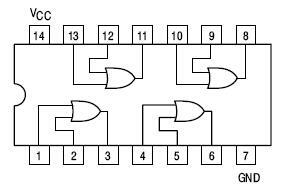 It is distinguished from the half adder which adds two one-bit numbers. The full adder combines two half adders and adds an OR gate to the the circuit. The circuit is called a full adder because the third bit is used to bring in the carry bit from a half adder or another full adder. The ability to integrate a carry-in bit enables multiple full adders to be chained together to build adders that can handle 4-bit, 8-bit and larger additions. 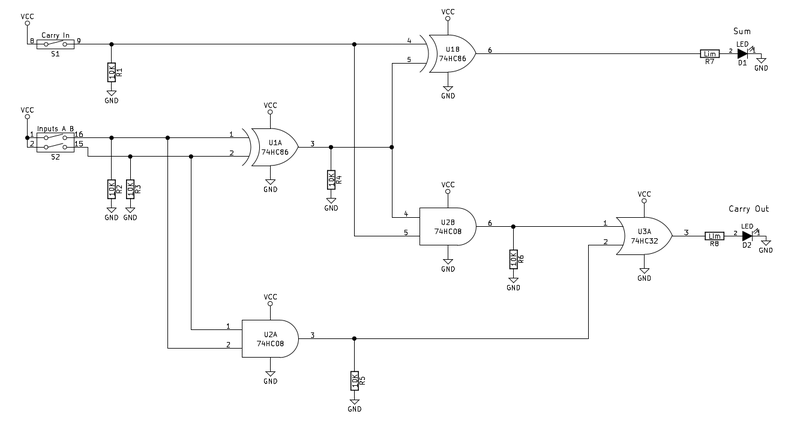 The full adder is implemented here using 74HCxx series high-speed CMOS digital logic ICs. In the schematic the 8 position DIP switch appears as two devices and unused switches are not shown. Refer to the board diagram for placement of the DIP switches. Be mindful of the notch on the IC package which indicates proper orientation of the device. The schematic symbols for the IC logic gates with multiple gates per chip are noted with A, B etc. 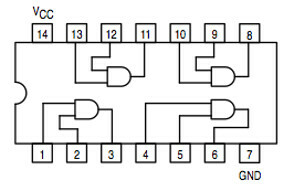 to designate the different gates on the same chip.